For many of the educators we speak with here at Daily Edventures, teaching can sometimes feel very isolating. MIE Expert Scott Titmas was one of those educators. Then he read a book that changed his life. Titmas’s favorite classroom activities revolve around collaboration, and “mixing-it-up” to get his students working together. Whether that’s a project in Office365 (Teams, OneNote, etc.) or on Flipgrid, Titmas says his students yearn for authentic learning experiences. While Titmas is no longer teaching on an “island,” he is still very aware of educators’ challenges, and he does his best to not add to the unprecedented pressure today’s teachers face. 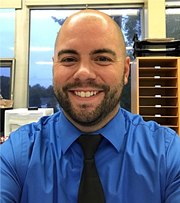 Connect with Scott Titmas on his Microsoft Educator Profile, his blog, or on Twitter. What is the best advice you have ever received? Take the risk!!! Website I check every day:Twitter! Favorite childhood memory:Summers down the shore with my grandparents. Favorite book: Teach Like a Pirate! What an inspiring post. EdTech in the classroom does open new doors and present wider horizons. Learning becomes more authentic and engaging when utilizing tech tools. It promotes mindfulness as well that brings about holistic growth for students.